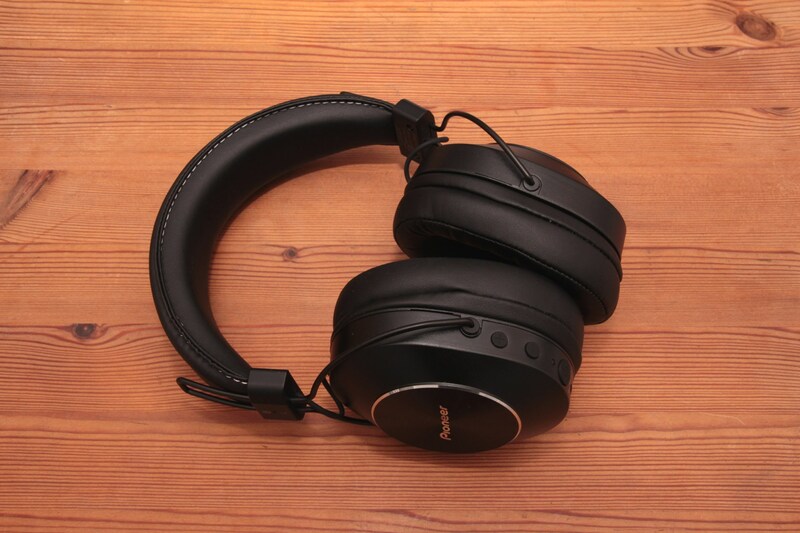 The design of the SE-MS7BT is based on classic hi-fi headphones. The ear cups are provided with metal covers, the ears are completely enclosed. Metal hinges hold the earcups and can be adjusted continuously in height. The headband is made of metal and has a very thick padding. The controls on the left indicate the more modern technology. A larger button is used for switching on and off and also for play/pause or for accepting telephone calls. With the two smaller buttons you can adjust the volume (for which you need to hold the buttons), or change the currently played track. 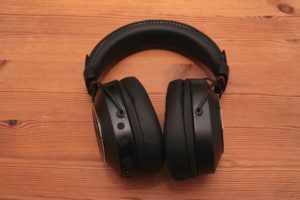 There is also a status LED, a microphone for the use as a headset, a micro USB jack for charging and a 3.5 mm jack for the supplied cable if you want to use the headphones passively without a Bluetooth connection. The only limitation is that the cable can not be used for the headset. The workmanship is very good and the headphone is also very comfortable. In addition to the padding of the headband, the ear cups are also padded nicely with a padding becoming somewhat thicker downwards. A nice detail: on the left side of the headbeand there is a marking which you can feel when touching it and which makes it easier to put the headphone on without looking at it in detail. I did the the first tests using a smartphone with Android, specifically a Sony Xperia Z3 Compact. The pairing worked quite smoothly – for this, hold the power button on the headphone for a while until the status LED flashes red and green. Then you can add the headphones as a new device in the smartphone in the Bluetooth settings. As soon as the status LED on the headphone flashes blue, the connection is established. The controls for the audio player in the smartphone work reliably as well. In addition I repeated the pairing with a PC with Windows 7 to check out the multiparing with up to 8 devices. The connection worked there as well without any problem and the device was added as a headset. Switching between the PC and the smartphone is also possible – you just have to remember to disconnect the existing connection on the PC before you try to connect to the smartphone (and vice versa). But it is not neccessary to do the paring again. My smartphone supports aptX for the audio transmission. This will also be displayed as a short notice when establishing the connection. Therefore the sound quality is quite good and without any noticable delays. You find additional information about aptX on https://www.aptx.com. There you will also find a list which devices support aptX. Another interesting article can be found on Lifewire, which also contains measurments and comparisions to SBC, the standard audio codec for Bluetooth. When connecting to a PC there is no indication which codec is being used for the transmission – but I could not notice any big difference in the sound quality and also no noticable delays for the playback. A cable connection is also possible (with the Bluetooth part turned off) and may be useful if you have an uncompressed audio source and want to have the original sound without any distortions. On the PC I like to use the headphone for music if I don’t want to disturb anyone. In this case I also don’t want to stay fixed in front of the PC but also to move around in the flat. For the connection a class 2 Bluetooth adapter is being used which was connected using a USB cable and positioned in a way that the signal can be distributed freely to all directions. Very nice: in the whole room where PC is located and also in the rooms next to it the connection was stable. Only if there is more than one wall between the PC and the headphones there will be interruptions which will disappear immediately when you get near enough again. For every day use this is perfectly adequate. Generally the use as a headset is possible, since there is a microphone integrated on the left side. In practice, however, you should not expect a very good sound quality. If you regularly need a headset for communicating via VoIP you better use a traditional solution with a microphone which you can position in front of your mouth.